One of the largest maritime archaeological projects ever staged, The Black Sea MAP (Maritime Archaeological Project), has revealed 60 astonishingly well-preserved shipwrecks, helping write the history of nearly 2,500 years of seafaring tradition in the Black Sea. Managed by EEF Expeditions Limited, with the University of Southampton leading scientific investigations, the project has revealed an extensive collection of wrecks using the latest robotic laser scanning, acoustic and photogrammetric techniques. The oldest of the ships found date from the Classical period, around the fourth or fifth century BC. Vessels have also been discovered from the Roman, Byzantine and Ottoman periods, spanning two-and-a-half millennia. Together, they represent an unbroken pattern of trade, warfare and communication that reaches back into prehistory. 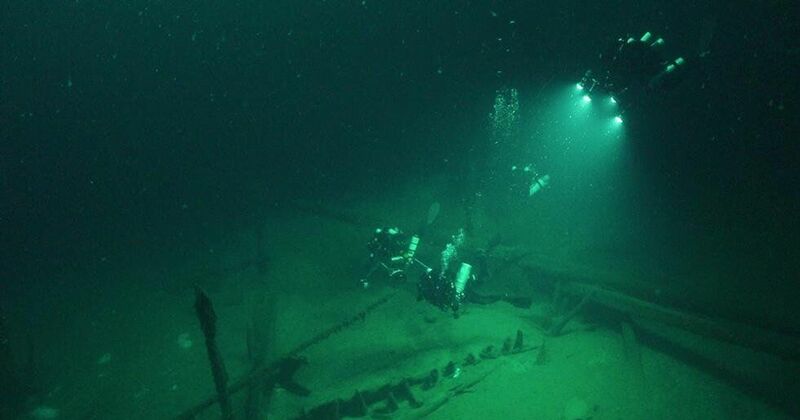 Due to the anoxic (oxygen lacking) conditions of the Black Sea below a certain depth, some of the wrecks have survived in incredible condition. They lie hundreds or thousands of metres deep, with their masts still standing, rudders in place, cargoes of amphorae and ship fittings lying on deck, with carvings and tool marks as distinct as the day they were made. Many show structural features, fittings and equipment that are only known from iconography or written description, but never seen until now. Chief Investigator Jon Adams, Professor in Maritime Archaeology and founding director of the University of Southampton’s Centre for Maritime Archaeology, says: “This assemblage must comprise one of the finest underwater museums of ships and seafaring in the world. “We dived on one wreck, a merchant vessel of the Byzantine period dating to the tenth century. It lies at a depth of 93 metres. This puts it into the diving range, so we took the opportunity to visually inspect certain structural features first-hand. In 2015, The Black Sea MAP set out to investigate the changes in the ancient environment of the region, including the impact of sea-level change following the last glacial cycle. Field studies have been conducted over three seasons – concluding in September 2017, with the team of world-renowned maritime scientists returning from their final trip with knowledge of some astonishing finds and a collection of amphorae and other fascinating artefacts. In addition to the discovery of the shipwrecks, the scientists excavated the remains of an early Bronze Age settlement at Ropotamo in Bulgaria, near what was the ancient shoreline when the sea level was much lower than today. As the waters rose, the settlement was abandoned and now the remains of house timbers, hearths and ceramics lie 2.5 metres below the seabed. The valley in which the village had lain became a sheltered bay visited by Greek colonists of the Archaic period, then a harbour for early Byzantine seafarers and finally an anchorage used by the Ottomans. The team has also continued its survey work in deep water up to 50km offshore using Surveyor Interceptor, a revolutionary remotely operated robotic vehicle, to carry out geophysical surveys along thousands of kilometres, revealing former land surfaces buried deep below the seabed – sampling them by extracting sediment cores up to 12m in length. From the materials in the cores the nature of the ancient environments can be reconstructed, including key processes of environmental change such as sea-level rise. The Black Sea MAP project was conceived by Hans K Rausing who established the Expedition and Education Foundation to commission the project. The Foundation’s work is funded by The Julia and Hans Rausing Trust, a charitable fund, reflecting their interest in improving our understanding of the origins of humanity and human civilization in the region. The Black Sea MAP (Maritime Archaeological Project), which is managed by EEF Expeditions Limited, seeks to further understanding of the origins of the Black Sea boundaries and how sea level change impacted early man. The three strands of the projects are the scientific exploration, promoting STEM subjects and careers, and filming a documentary about the expedition to reach as wide an audience as possible. Throughout the project, the team has been employing cutting edge technology to enhance their investigations. The scientific element of The Black Sea MAP is led by some of the world’s preeminent marine archaeologists and maritime scientists from the UK (University of Southampton), Bulgaria (Centre of Underwater Archaeology), Sweden (Södertörn University), the US (University of Connecticut) and Greece (Institute of Oceanography of the Hellenic Centre for Marine Research). Photogrammetry: Many of the images produced by the Black Sea MAP project are digital models created from photographs using the process photogrammetry, the technique of constructing a 3D model by computing the position of any point that is visible in any two adjacent images. Software computes the 3D positions of millions of points in space in this case from thousands of photographs (taken by the cameras on the ROV) and builds the model. What is seen in the final image is the model rendered and overlaid with the colours and textures from the photos to create an accurate representation. Processing takes days even with the fastest computers. The project had six going 24hrs a day. During both the 2016 and 2017 field season, The Black Sea MAP has chartered vessels from Swedish based MMT & Reach Subsea. Normally focused on surveying for the offshore industry, MMT/Reach has provided specialist world record-breaking marine surveying capability in the form of two ROV’s (Remote Operated Vehicles) to investigate the ‘anoxic’ depths of the Black Sea and well as a wide array of ship-mounted systems which helped map these ancient landscapes. For this year’s field season, the project was launched off the R/V Havila Subsea, a long-term partner of MMT.